in large part due to its years under the Soviet Union. Partly because of the country's enormous semi-arid steppe, the Soviet government used Kazakhstan as its nuclear testing site. Along with near-absent pollution controls, this has contributed to an alarmingly high rate of disease in many rural areas. Kazakhstan has identified at least two major ecological disasters within its borders: the shrinking of the Aral Sea, and radioactive contamination at the Semipalatinsk nuclear testing facility (in fact a large zone south of Kourchatov (Курчатов)) and along the Chinese border. Most of Kazakhstan’s water supply has been polluted by industrial and agricultural runoff and, in some places, radioactivity. The Aral Sea, which is shared with Uzbekistan, has shrunk to three separate bodies of water because of water drawdowns in its tributary rivers. A Soviet-era biological weapons site is a threat because it is located on a former island in the Aral Sea that is now connected with the mainland. 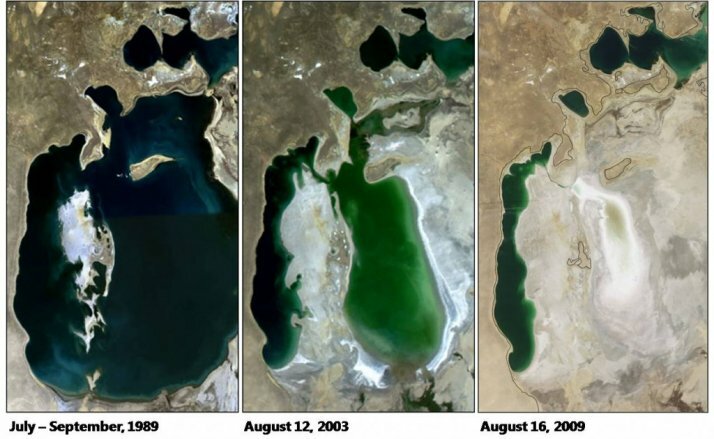 The reduction in the Aral Sea’s water surface has exacerbated regional climatic extremes, and agricultural soil has been damaged by salt deposits and eroded by wind. Desertification has eliminated substantial tracts of agricultural land. Plants in industrial centers lack controls on effluents into the air and water. The Semey region in the northeast has long-term radiation contamination from Soviet-era weapons testing. The Ministry of Environmental Protection is underfunded and given low priority. Some new environmental regulation of the oil industry began in 2003, but new oil operations on Kazakhstan’s Caspian coast add to that sea’s already grave pollution. International programs to save the Aral and Caspian seas have not received meaningful cooperation from Kazakhstan or other member nations. The Aral Sea covers 26, 300 square miles with Kazakhstan to the north and Uzbekistan to the south. Soviet irrigation projects begun in the 1960s and other environmental challenges have severely depleted this once massive inland sea and by 2007, it had shrunk to 10 percent of its original size.